In the early 1960s, the Pilkington Committee reported on the future of broadcasting. The committee, chaired by industrialist Sir Harry Pilkington , criticised the existing structure of ITV and recommended that it should be reorganised so that the independent companies should produce and sell programmes to the Independent Television Authority and that the ITA should in turn schedule the programmes and sell advertising time. The report also proposed that the BBC should be authorised as soon as possible to provide a third television channel. Among its other recommendations were that the line of definition standard in Britain should be changed from 405 lines to 625 - the general standard used in Europe - and that a service of colour television on 625 lines, also in the ultra high frequency (UHF) bands, should be introduced as soon as possible. In July 1962, the government published a White Paper which approved a number of the Report's recommendations. It was agreed that by 1964 the BBC should launch a second TV channel on 625 lines in UHF; the channel would be available first to the London area only, but it was expected to cover the whole of Britain by 1970. The go-ahead was also given for the development of colour television, and the BBC was authorised to establish a self-contained, distinctive Welsh TV service, to extend its broadcasting hours, and to produce more educational programmes for adults. A second memorandum on the Report, in December 1962, outlined the government's views on the future of the ITA . The paper stated that statutory powers would be taken to strengthen the ITA 's control over contracting companies, and that responsibility for approval and supervision of the buying and selling of programmes, and for the content and quality of the service as a whole, would pass to the Authority . The government saw little evidence of public demand for a second commercial channel, and felt there would be insufficient advertising revenue to sustain two such channels. Three new ITV stations came into being during 1961, with Westward Television serving south-west England, Border Television for the Border region, and Grampian Television for north Scotland. Channel Television , for the Channel Islands, and Wales-West and North (WWN) followed in 1962. Border Television also serviced the Isle of Man from 1965. In January 1964, Lord Hill of Luton , chairman of the ITA , announced administrative changes which ensured a tighter watch over ITV programmes and advertising, and made clear that no changes would be made to the existing contractors from 1964 to 1967, when it was expected that a second ITV channel would be launched. The programme schedules of the companies would from then on be drawn up in consultation with the ITA . The ITA would have access to all advertisements before transmission, and a new committee, under the chairmanship of the Authority, would settle all doubtful cases. In February 1965, the government decided to end the advertising of cigarettes on television; in March the Postmaster-General announced that the ban would take effect from 1 August. The summer of 1967 saw the ITA announce the new independent television companies awarded contracts for six years as from July 1968. Three new ITV companies came into existence at this time: the London Television Consortium (which quickly became London Weekend Television ), taking over weekend programming for the London area, Telefusion Yorkshire (subsequently renamed Yorkshire Television ), and the Harlech Consortium (subsequently HTV ), replacing TWW in Wales and part of the west of England. The London weekday contract went to a company, to be called Thames Television , formed by the amalgamation of Rediffusion and ABC TV , with ABC having the controlling interest. ATV , which had been serving the midlands during weekdays and London at weekends, received the full week contract for the midland region. All the other ITV companies had their contracts renewed. September 1963 saw the BBC launch a campaign to familiarise viewers with the new BBC2 network, symbolised by an illustrated kangaroo character, which appeared in a series of short trailers giving information about the new service. BBC2 opened on the 625-line system in the London area on 21 April 1964 - twenty-four hours later than announced due to a power failure, which effectively blacked out the launch of the infant channel. Discussions on proposals for a 'University of the Air' led to a government announcement in September 1967 that it would create a new university institution to provide courses leading to degrees and other qualifications through a combination of television, radio, correspondence, tutorials, and local audio-visual centres. It was hoped that this Open University would be launched by autumn 1970 via BBC2. The advent of colour television, encouraged by the 1962 White Paper, was heralded by advances later that year. Following some two months of tests in their 625-line experimental service, radiating purely engineering information from Crystal Palace, BBC TV began in November 1962 to add full colour to some transmissions, broadcasting for seven-and-a-half hours a day, Monday to Friday. Although the American NTSC system was initially used, in April 1963 the BBC began testing the French Secam colour system, in co-operation with the GPO , the ITA , and the radio industry. There was also interest in the PAL system, which was a modified version of the NTSC system produced by the Telefunken Company in Germany. Meanwhile discussion and controversy continued on the allocation of colour television in Britain. Reviving an earlier technical proposal (described as 'sound on synchronised pulses'), the BBC planned to introduce a standardised 625-line system using the German PAL colour system which, it was hoped, might help to transfer BBC1 and ITV from 405 lines to 625, thereby facilitating the provision of colour television on all channels. Following a limited colour service on BBC2 from 1 July 1967 (five hours a week), the colour service began officially on Saturday, 2 December 1967, with some 27 to 29 hours of colour per week. The programming trends of the 1960s ranged in popularity from the heights of drama ( The Wednesday Play , BBC, 1964-70) to the extremes of escapism ( The Avengers , ITV, 1961-69), with a new television comedy form ( Till Death Us Do Part , BBC, 1966-75) edging in somewhere between the two. The 'new wave' of television drama area was represented, for the most part, by The Wednesday Play , BBC TV 's controversial series of original plays written specifically for TV by new writers. Although The Wednesday Play 's ground-breaking inheritance came directly from Armchair Theatre (ITV, 1956-74) - and the latter programme's Sydney Newman years in particular - the presentation of such outstanding plays as Jeremy Sandford 's 'Cathy Come Home' (tx. 16/11/1966), Dennis Potter 's 'Vote, Vote, Vote for Nigel Barton' (tx. 15/12/1965), and Nell Dunn 's 'Up the Junction' (tx. 3/11/1965) won BBC TV both kudos and condemnation. Directly-to-the-point drama series such as Z Cars (BBC, 1962-78), The Power Game (ITV, 1965-66), and the later Callan (ITV, 1967-72) offered weekly instalments of gritty, realistic, and perhaps at times overly negative characters and plots. A North Country-based twice-weekly serial, Coronation Street (ITV, 1960-), took the so-called 'kitchen sink' drama style to new television dimensions and maintained a faithful audience at the top of the ratings for many years. The escapist element arrived in the mid-1960s, inspired by the sudden popularity of the spy/espionage genre, especially following the cinema success of the James Bond novels. One of the earliest and most bizarre of these was The Avengers , which had started out as a straightforward government agent drama (in a somewhat similar vein to Danger Man (ITV, 1960-61; 1964-69)) before it became the inspiration for similar series that followed: The Champions (ITV, 1968-71, The Prisoner (ITV, 1967-68), The Corridor People (ITV, 1966). 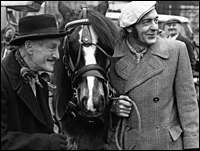 Comedy and humour also reached a new peak with the programming of That Was the Week That Was (BBC, 1962-63), introducing satire to the general audience, and the controversial sitcom series, Galton & Simpson 's Steptoe and Son (BBC, 1962-65; 1970-74), and Johnny Speight 's Till Death Us Do Part . The mid-1960s off-the-wall comedy skits, At Last the 1948 Show (ITV, 1967-68), Do Not Adjust Your Se t (ITV, 1968-69), and others, led to a new turning-point of TV comedy represented by Monty Python's Flying Circus at the end of the decade. It may be significant to note that this new-found freedom of expression and creativity flourished under the Harold Wilson Labour Government (1964-1970), which also heralded the 'Swinging London' years and their related youth industries (fashion, music, photography, design; itself fused into programmes like Adam Adamant Lives! (BBC, 1966-67)).